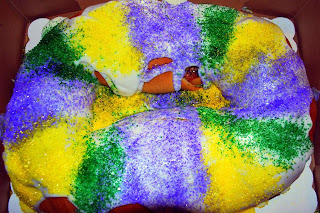 Happy Mardi Gras- Laissez les bons temps rouler!! * Warning: photos of women's breast. This past weekend we celebrated Mardi Gras in North Louisiana with the Krewe of Gemini Parade. The weekend before was the Krewe of Centaur. This is the parade that our own Krewe of Justinian participates in. Mardi Gras is music, parades, floats, picnics, excitement and..... lots of booze. It is one big holiday in Louisiana and in triplicate for New Orleans. Everyone wears purple, green & gold adorned with long beads caught from the beautiful floats. The grounds are jam packed with spectators throwing balls , cooking out, playing music, dancing & watching the crowds walk between parades. During Mardi Gras, all of the businesses and roads are practically shut down~~people are walking everywhere, hanging out with friends and meeting new ones. Everyone is dressed in crazy costumes, kids are everywhere and they love it. It is a state holiday and schools are closed the last week of Mardi Gras. Interested in how it all began? 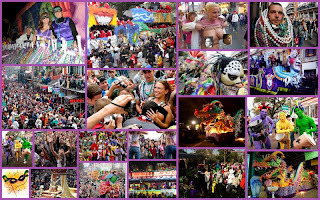 Interested in the history & tradition of Mardi Gras. 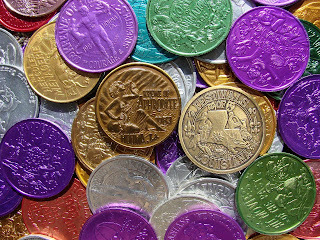 Click on the links below the photos for more information on Mardi Gras. Fact or myth? 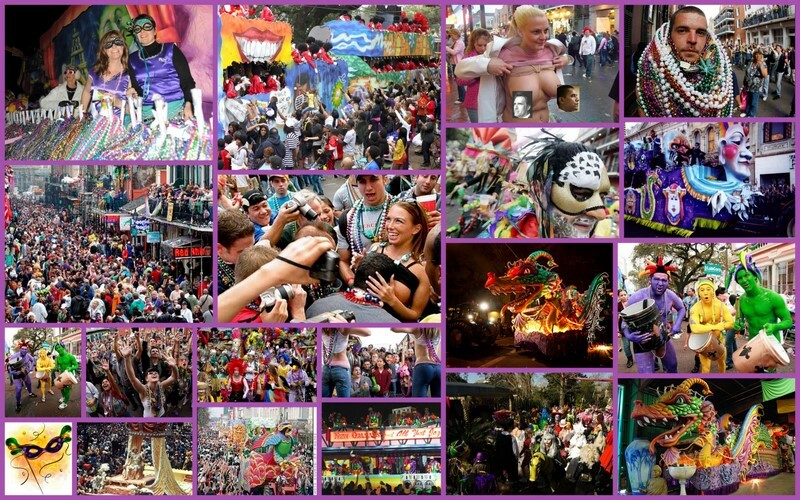 Mardi Gras is only for adults & drunks and is no place for children? Drunken Lunkheads? “ The throwing of trinkets to the crowds was started in the early 1870s by the Twelfth Night Revelers, and is a time-honored expectation for young and old alike. 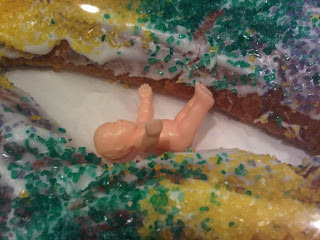 The baby is located somewhere inside the cake. Does anyone know what it means if you find the baby inside your slice of King Cake? Mardi Gras is one big party. While most people think of parades when they think of Mardi Gras, there are many other Mardi Gras traditions. Krewe members work hard all year on the floats, parades, balls & other traditions. After the parades end we strip the floats and begin building for the next year. The wood on the float is good for two years so we change the theme of our individual floats every two years. Throughout the year we have float building parties. A few weeks before the parades begin each Krewe host their own coronation ball where the royalty is adorned, debutantes are announced and the identity of the closely guarded secret of the identity of the new King & Queen is revealed. It is part of the mystique -keeping their identity a secret until the night of the ball. The mystery and tradition of the balls is too lengthy to discuss here. I will devote a separate post to the mystery and intrigue of the famous Mardi Gras Ball & royalty. Most aristocratic Balls are by invitation only and then only a a select group make the cut. People no longer feel left out if they are not invited to the prestigious aristocratic Balls. Lots of folks don't make the final list-including some governors who have made it known that they want to attend. 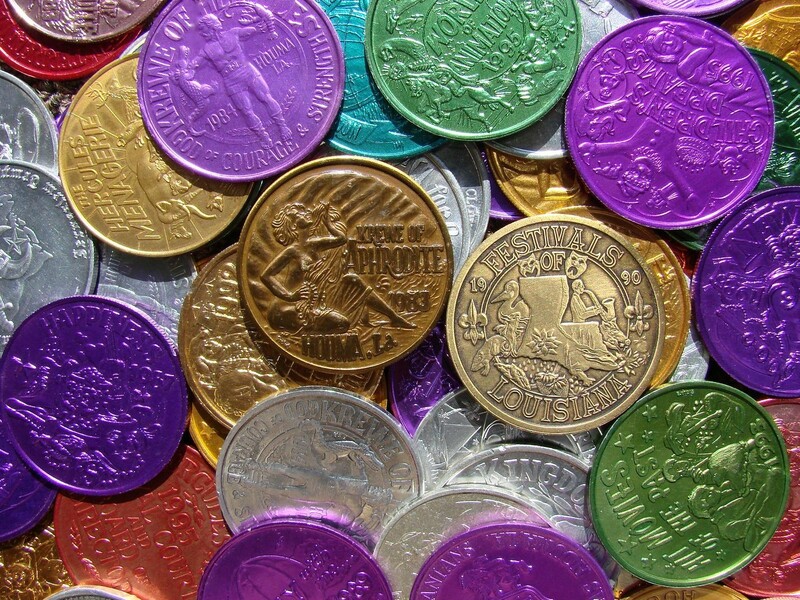 While Mardi Gras is traditionally known for the parties and drinking we try to remember the true meaning of Mardi Gras. New Orleans is a predominantly Catholic/Christian city~~& this is how Ash Wednesday is celebrated. I am Jewish, but I honor and respect the Catholic traditions and I participate in every aspect of Mardi Gras. The last day before Ash Wednesday (FAT TUESDAY) is when the Catholics receive ashes and begin 40 days of sacrifice in imitation of Our Lord, ending on Easter Sunday, with the celebration of the Resurrection. 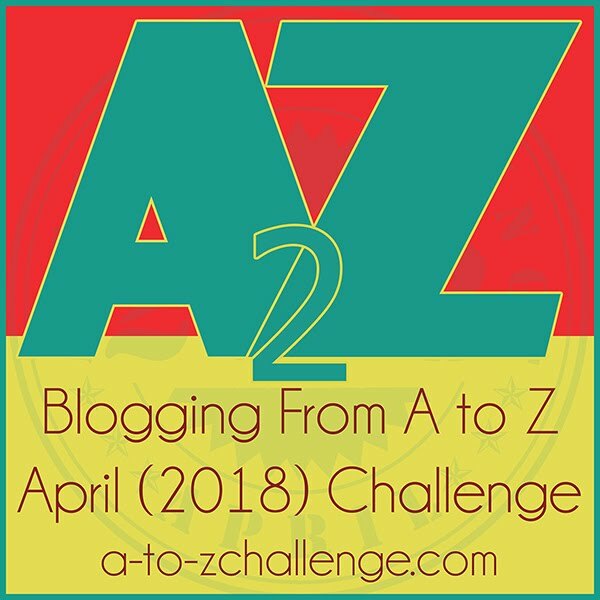 I think I had just as much fun reading your post (and looking at the images - won't lie about that!) as I would attending the event. Maybe more since I'm not a party guy! Mardi Gras is big in Sydney too, but I've never attended. Even though I'm not a fan of crowds, it looks like lots of fun. That really looks like a lot of fun! We don't have that in the UK, which makes me sad because I think I'd enjoy it! I've never experienced Mardi Gras. I suppose exposing the breasts is a form of liberation, rebellion? Not sure about the poor baby in the cake, awh! Does it represent fertility perhaps like the Cerne Abbas giant? I've never been to a Mardi Gras. Looks like a lot of fun. Maybe one of these days I'll make it out for one. I think I am past my Mardi Gras stage of life but it looks like a great time is certainly being had by all. I have a bunch of the Mardi Gras beads I wear to school that day (tomorrow). The children in my art classes love to see them. Thanks for the great article and photos! That's an experience I've always wanted to have. Great post. I enjoyed reading about Mardi Gras. I'm still trying to figure out what I'll be giving up for Lent. I was in New Orleans for a weekend many years ago, and I loved it! 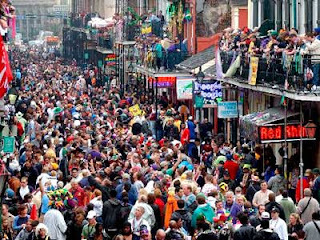 I don't think I could handle the crowds and hysteria for Mardi Gras, though it really does look like fun! 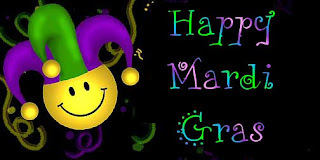 Mardi Gras sounds like a lot of fun--and also sounds a bit scary. Especially when I remember walking down Bourbon Street ..
Melissa, for some reason the comment box for the post above this won't appear!